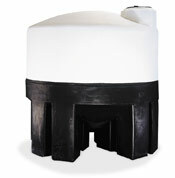 AllTanksCom LLC offers a large inventory of cone bottom tanks to meet your plastic tank needs. Our tanks and support stands are rotational molded of linear FDA-NSF approved resins. Made of polyethylene, these tanks can handle some of the most corrosive chemicals in use today. Match your chemicals with gaskets, process connection materials, and our polyethylene tank. The great thing about cone bottom tanks is “full drainage,” which allows you to increase your quality control as well as use the tank for different products and purposes. Options available include, process connections in PVC, PolyPro and stainless steel, mixer bridges, supported pipe outlets, ladders, skids, level indicators, and switches. Gasket materials include EPDM, Viton, Nitrile, and Teflon. Cone bottom tanks can be used as water tanks, liquid storage tanks, wine & beer fermentation tanks, or for mixing chemicals and biodiesel production. P Distance from bottom of cone to ground.